We propose a protocol that shows how to differentiate induced pluripotent stem cell-derived keratinocytes and fibroblasts and generate a 3D skin organoid, using these keratinocytes and fibroblasts. This protocol contains an additional step of generating a humanized mice model. The technique presented here will improve dermatologic research. Kim, Y., Ju, J. H. Generation of 3D Skin Organoid from Cord Blood-derived Induced Pluripotent Stem Cells. J. Vis. Exp. (146), e59297, doi:10.3791/59297 (2019). The skin is the body’s largest organ and has many functions. The skin acts as a physical barrier and protector of the body and regulates bodily functions. Biomimetics is the imitation of the models, systems, and elements of nature for the purpose of solving complex human problems1. Skin biomimetics is a useful tool for in vitro disease research and in vivo regenerative medicine. Human induced pluripotent stem cells (iPSCs) have the characteristic of unlimited proliferation and the ability of differentiation to three germ layers. Human iPSCs are generated from various primary cells, such as blood cells, keratinocytes, fibroblasts, and more. Among them, cord blood mononuclear cells (CBMCs) have emerged as an alternative cell source from the perspective of allogeneic regenerative medicine. CBMCs are useful in regenerative medicine because human leukocyte antigen (HLA) typing is essential to the cell banking system. We provide a method for the differentiation of CBMC-iPSCs into keratinocytes and fibroblasts and for generation of a 3D skin organoid. CBMC-iPSC-derived keratinocytes and fibroblasts have characteristics similar to a primary cell line. The 3D skin organoids are generated by overlaying an epidermal layer onto a dermal layer. By transplanting this 3D skin organoid, a humanized mice model is generated. This study shows that a 3D human iPSC-derived skin organoid may be a novel, alternative tool for dermatologic research in vitro and in vivo. Skin covers the outermost surface of the body and protects internal organs. The skin has various functions, including protecting against pathogens, absorbing and storing water, regulating body temperature, and excreting body waste2. Skin grafts can be classified depending on the skin source; grafts using skin from another donor are termed allografts, and grafts using the patient’s own skin are autografts. Although an autograft is the preferred treatment due to its low rejection risk, skin biopsies are difficult to perform on patients with severe lesions or an insufficient number of skin cells. In patients with severe burns, three times the number of skin cells are necessary to cover large areas. The limited availability of skin cells from a patient’s body results in situations where allogenous transplantation is necessary. An allograft is temporarily used until autologous transplantation can be performed since it is usually rejected by the host’s immune system after approximately 1 week3. To overcome rejection by the patient’s immune system, grafts must come from a source with the same immune identity as the patient4. Human iPSCs are an emerging source of cells for stem cell therapy5. Human iPSCs are generated from somatic cells, using reprogramming factors such as OCT4, SOX2, Klf4, and c-Myc6. Using human iPSCs overcomes the ethical and immunological issues of embryonic stem cells (ESCs)7,8. Human iPSCs have pluripotency and can differentiate into three germ layers9. The presence of HLA, a critical factor in regenerative medicine, determines the immune response and the possibility of rejection10. The use of patient-derived iPSCs resolves the problems of cell-source limitation and immune system rejection. CBMCs have also emerged as an alternative cell source for regenerative medicine11. Mandatory HLA typing, which occurs during CBMC banking, can easily be used for research and transplantation. Further, homozygous HLA-type iPSCs can widely apply to various patients12. A CBMC-iPSC bank is a novel and efficient strategy for cell therapy and allogenic regenerative medicine12,13,14. In this study, we use CBMC-iPSCs, differentiated into keratinocytes and fibroblasts, and generate stratified 3D skin layers. Results from this study suggest that a CBMC-iPSC-derived 3D skin organoid is a novel tool for in vitro and in vivo dermatologic research. All procedures involving animals were performed in accordance with the Laboratory Animals Welfare Act, the Guide for the Care and Use of Laboratory Animals, and the Guidelines and Policies for Rodent Experimentation provided by the Institutional Animal Care and Use Committee (IACUC) of the School of Medicine of The Catholic University of Korea. The study protocol was approved by the Institutional Review Board of The Catholic University of Korea (CUMC-2018-0191-01). The IACUC and the Department of Laboratory Animals (DOLA) of the Catholic University of Korea, Songeui Campus accredited the Korea Excellence Animal laboratory facility of the Korea Food and Drug Administration in 2017 and acquired Association for Assessment and Accreditation of Laboratory Animal Care International (AAALAC) International full accreditation in 2018. NOTE: Store all medium at 4 °C in a dark environment for up to 3 months. Filter all medium using a 0.22 μm polyethersulfone filter system before use for sterilization. All medium was available in a total volume of 500 mL. Prepare KDM1 (keratinocyte differentiation medium 1). Mix Dulbecco’s Modified Eagle’s Medium (DMEM)/F12 medium (3:1) with 2% fetal bovine serum (FBS), 0.3 mmol/L L-ascorbic acid, 5 μg/mL insulin, and 24 µg/mL adenine. Prepare KDM2 (keratinocyte differentiation medium 2). Mix defined keratinocyte serum-free medium (see the Table of Materials) with 0.3 mmol/l L-ascorbic acid, 5 μg/mL insulin, and 10 μg/mL adenine. NOTE: Defined keratinocyte serum-free medium is optimized to support the growth and expansion of keratinocytes. Prepare KDM3 (keratinocyte differentiation medium 3). Mix defined keratinocyte serum-free medium and keratinocyte serum-free medium (1:1) See the Table of Materials for details. NOTE: Keratinocyte serum-free medium is optimized for the growth and maintenance of keratinocytes. Prepare FDM1 (fibroblast differentiation medium 1). Mix DMEM/F12 medium (3:1) with 5% FBS, 5 μg/mL insulin, 0.18 mM adenine, and 10 ng/mL epidermal growth factor (EGF). Prepare FDM2 (fibroblast differentiation medium 2). Mix DMEM/F12 medium (1:1) with 5% FBS and 1% nonessential amino acids. Prepare EP1 (epithelial medium 1). Mix DMEM/F12 (3:1) with 4 mM L-glutamine, 40 μM adenine, 10 μg/mL transferrin, 10 μg/mL insulin, and 0.1% FBS. Prepare EP2 (epithelial medium 2). Mix EP1 and 1.8 mM calcium chloride. Prepare EP3 (epithelial medium 3, cornification medium). Mix F12 medium with 4 mM L-glutamine, 40 μM adenine, 10 μg/mL transferrin, 10 μg/mL insulin, 2% FBS, and 1.8 mM calcium chloride. Generate CBMC-iPSCs using the protocol shown in a previous study12. Coat culture dishes, using vitronectin. Prepare 5 mL to coat a 100 mm dish. Thaw and resuspend 50 μL of 0.5 mg/mL vitronectin (final concentration: 5 µg/mL) with 5 mL of sterile phosphate-buffered saline (PBS). Add the solution to the dishes and incubate at room temperature (RT) for 1 h. Aspirate the coating material before use (not to dry out). Maintain the CBMC-derived iPSCs to the vitronectin-coated 100 mm plate and change the iPSC medium (E8) daily at 37 °C with 10% CO2. Generate embryonic bodies (EBs) using the protocol shown in a previous study15 (described briefly as follows). Expand iPSCs by changing the medium until the cells have reached 80% confluence. At 80% confluence, remove the medium and wash with PBS. Treat the cells with 1 mL of 1 mM ethylenediaminetetraacetic acid (EDTA). Incubate at 37 °C with 5% CO2 for 2 min and harvest the cells using 3 mL of E8 medium. Centrifuge the cells at 250 x g for 2 min. Aspirate the supernatant and apply 5 mL of E8 medium to the cells. Count the cells using a hemocytometer and transfer 1 x 106 cells to a new 15 mL conical tube. Centrifuge the cells at 250 x g for 2 min. Resuspend the transferred cells with 2.5 mL of EB formation medium with 10 μM Rho-associated kinase (ROCK) inhibitor. Drop 1 x 104 cells (25 µL/drop) on a noncoated culture plate lid using a 10–100 μL multichannel pipette. Form 100 EBs from 1 x 106 cells (1 x 104 cells/1 EB). Turn over the dish and hang on the droplet to the lid. NOTE: ROCK inhibitor is needed during the attachment step in the maintenance and differentiation process. Add the ROCK inhibitor only at the EB aggregation stage. Incubate the droplets at 37 °C with 5% CO2 for 1 day. The next day, harvest the 100 EBs and use them for differentiation. Wash out the lid of plate with iPSC medium (E8 medium) or PBS and harvest its contents to a 50 mL conical tube. Maintain the EBs at RT for 1 min to settle them down. Aspirate the supernatant, resuspend the EBs with E8 medium, and maintain them in a 90 mm Petri dish until the differentiation. NOTE: For a scheme of the keratinocyte differentiation from CBMC-iPSCs, see Figure 1A. Harvest the 100 EBs to a 50 mL conical tube with iPSC medium or PBS. Maintain at RT for 1 min to settle down the EBs. Make sure they settle at the bottom of the conical tube. Aspirate the supernatant and resuspend the EBs with E8 medium with 1 ng/mL bone morphogenetic protein 4 (BMP4). Transfer the EBs to a 90 mm Petri dish and maintain them at 37 °C with 5% CO2 for 1 day. Coat culture dishes, using type IV collagen. Prepare 5 mL of type IV collagen to coat a 100 mm dish. Thaw and resuspend the type IV collagen solution (final concentration: 50 µg/mL) with 0.05 N HCl. Add the solution to the dishes and incubate at RT for 1 h. Aspirate the coating material before use (not to dry out). NOTE: Before using the plates, wash the dishes 3x with PBS to remove any acid. Harvest the EBs (step 1.3.1) to a 50 mL conical tube and maintain them at RT for 1 min to settle them down. Make sure they settle at the bottom of the conical tube, aspirate the supernatant, and resuspend the EBs in 6 mL of KDM1 with 10 µM ROCK inhibitor. Transfer the EBs to the type IV collagen-coated 100 mm dish. NOTE: Add the ROCK inhibitor only at the EB attachment stage. Between days 0–8, change the medium every other day to KDM1 with 3 µM retinoic acid (RA) and 25 ng/mL each of BMP4 and EGF. Maintain the EBs at 37 °C with 5% CO2. Between days 9–12, change the medium every other day to KDM2 with 3 µM RA, 25 ng/mL BMP4, and 20 ng/mL EGF. Between days 13–30, change the medium every other day to KDM3 with 10 ng/mL BMP4 and 20 ng/mL EGF. NOTE: For a scheme of the fibroblast differentiation from CBMC-iPSCs, see Figure 2A. Coat culture dishes, using basement membrane matrix. Prepare 5 mL to coat a 100 mm dish. Thaw basement membrane matrix (final concentration: 600 ng/mL) and dilute it with DMEM/F12 medium. Add the solution to the dishes and incubate at 37 °C for 30 min. Aspirate the coating material before use (not to dry out). Harvest the 100 EBs to a 50 mL conical tube using a pipette with iPSC medium or PBS. Maintain at RT for 1 min to settle down the EBs. Ensure they settle at the bottom of the conical tube. Remove the supernatant. Resuspend the EBs using a 1,000 µL pipette in 6 mL of FDM1 with 10 µM ROCK inhibitor. Transfer the EBs (with medium) to a basement membrane matrix-coated 100 mm dish and incubate at 37 °C with 5% CO2. Refresh the FDM1 every other day for 3 days. NOTE: Only add the ROCK inhibitor at the EB attachment stage. Add 0.5 nM bone morphogenetic protein 4 (BMP 4) to the FDM1 between days 4 and 6. At day 7, change the medium to FDM2 every other day for 1 week. At day 14, add 1 mL of 1 mM EDTA and incubate at 37 °C with 5% CO2 for 2 min. Harvest the cells with 3 mL of FDM2 and centrifuge at 250 x g for 2 min. Remove the supernatant and resuspend the cells in 5 mL of FDM1. Count the cells using a hemocytometer, resuspend 2 x 106 cells with FDM1 medium, and transfer the cells to the noncoated dish. Maintain the cells at 37 °C with 5% CO2 and change the medium every other day. Coat culture dishes, using type I collagen. Prepare 5 mL to coat a 100 mm dish. Dilute type I collagen solution (final concentration: 50 µg/mL) in 0.02 N acetic acid. Add the solution to the dishes and incubate at RT for 1 h. Aspirate the coating material before use (not to dry out). NOTE: Before using the plates, wash the dishes 3x with PBS to remove the acid. On day 21, add 1 mL of 1 mM EDTA and incubate at 37 °C with 5% CO2 for 2 min. Harvest the cells with 3 mL of FDM1 and centrifuge at 250 x g for 2 min. Remove the supernatant and resuspend the cells in 5 mL of FDM1. Count the cells using a hemocytometer and transfer 2 x 106 cells to the type I collagen-coated 100 mm dish with FDM1 medium. Maintain the cells at 37 °C with 5% CO2 and change the medium every other day. On day 28, add 1 mL of 1 mM EDTA and incubate at 37 °C with 5% CO2 for 2 min. Harvest the cells with 3 mL of FDM1 and centrifuge at 250 x g for 2 min. Remove the supernatant and resuspend the cells in 5 mL of FDM1. Count the cells using a hemocytometer and transfer 2 x 106 cells to a noncoated dish with FDM1 medium. Maintain the cell at 37 °C with 5% CO2 and change the medium every other day. NOTE: iPSC-derived fibroblasts proliferate like a primary fibroblast cell line and passage up to 10 passages. In this study, we used iPSC-derived fibroblasts of two to five passages for further analysis. Prepare neutralized type I collagen on ice, following the manufacturer’s recommendations. As final concentration, use 3 mg/mL for type I collagen (stock concentration of type I collagen is 3.47 mg/mL), and make sure the final volume of the mixture is 5 mL. Calculate the volume of 10x PBS (final volume/10 = 0.5 mL). Calculate the volume of type I collagen to be used (final volume x final collagen concentration / stock collagen concentration = 5 mL x 3 mg/mL / 3.47 mg/mL = 4.32 mL). Calculate the volume of 1 N NaOH (volume of collagen to be used x 0.023 mL = 0.1 mL). Calculate the volume of dH2O (final volume - volume of collagen - volume of 10x PBS - volume of 1 N NaOH = 5 mL - 4.32 mL - 0.5mL - 0.1 mL = 0.08 mL). Mix the contents of the tube and keep it on ice until ready to use. Add 1 mL of EDTA to the iPSC-derived fibroblasts from step 1.4.10 and incubate at 37 °C with 5% CO2 for 2 min. Harvest the detached cells, count the cells using a hemocytometer, and transfer 2 x 105 cells to a new 15 mL conical tube. Centrifuge at 250 x g for 2 min and remove the supernatant. Resuspend the cells of the iPSC-derived fibroblasts in 1.5 mL of FDM1 and neutralized the type I collagen solution (1:1). NOTE: Mix the solution gently to avoid bubbles. Place the membrane insert on a 6-well microplate, transfer the mixture to the insert, and incubate at RT for 30 min. NOTE: Do not move the plates. After confirming the gelation, add 2 mL of medium to the top of the insert and 3 mL to the bottom of the well. Incubate the matrix of fibroblasts and collagen at 37 °C with 5% CO2 for 5-7 days, until the gelation is complete and no longer contracts. After the complete gelation, detach the iPSC-derived keratinocytes (from step 1.3.6) using EDTA. Add 1 mL of EDTA and incubate at 37 °C with 5% CO2 for 2 min. Harvest the detached cells, count them using a hemocytometer, and transfer 1 x 106 cells to a new 15 mL conical tube. Centrifuge at 250 x g for 2 min. Remove the supernatant and resuspend 1 x 106 cells in 50-100 µL of low calcium epithelial medium 1 (EP1). Aspirate all medium in the matrix (see step 2.1.5) and seed 1 x 106 cells of the iPSC-derived keratinocytes onto each fibroblast layer. Incubate the plate at 37 °C with 5% CO2 for 30 min. NOTE: Do not move the plate and do not add any medium for the attachment of keratinocyte. Add 2 mL of EP1 to the top of the insert and 3 mL of EP1 to the bottom of the well. After 2 days, aspirate all medium in the membrane insert plate and change the medium to normal calcium EP2 for 2 days. After 2 days, aspirate all medium and add 3 mL of the cornification medium only to the bottom to generate an air-liquid interface. Maintain the 3D skin organoid for up to 14 days at 37 °C with 5% CO2 and change the medium every other day. Harvest the 3D skin organoid by cutting the edge of the insert, and use it for a further study of staining and skin graft. Perform inhalation anesthesia on NOD/scid mice (male, 6 weeks old), using a standard, institutionally approved method. For skin graft, shave the fur of each mouse’s dorsal skin. Remove a 1 cm x 2 cm section of the mouse’s skin, using curved scissors with forceps. Place the CBMC-iPSC-derived 3D skin organoid onto the defect site and suture using a tie-over dressing method with silk sutures. Observe the mice for 2 weeks and sacrifice them for histological analysis. The staining protocol was verified in previous studies16. Skin is composed, for the most part, of the epidermis and the dermis. Keratinocytes are the main cell type of the epidermis, and fibroblasts are the main cell type of the dermis. The scheme of keratinocyte differentiation is shown in Figure 1A. CBMC-iPCSc were maintained in a vitronectin-coated dish (Figure 1B). In this study, we differentiated CBMC-iPSCs into keratinocytes and fibroblasts using EB formation. We generated EBs using the hanging drop method to ensure a uniform and controlled differentiation of keratinocytes and fibroblasts (Figure 1C). EBs were attached to type IV collagen-coated plates for keratinocyte differentiation, and the medium was changed daily. CBMC-iPSCs were treated with RA, BMP4, and EGF. CBMC-iPSCs were differentiated to keratinocytes. During the differentiation, the morphology of the CBMC-iPSC-derived keratinocytes changed over time (Supplementary Figure 1). CBMC-iPSC-derived keratinocytes have morphologies similar to primary keratinocytes (Figure 1D). The gene expression of the pluripotent marker OCT4 was downregulated in CBMC-iPSC-derived keratinocytes. Primer sequences are shown in Table 1. The expression of keratinocyte markers Np63, KRT5, and KRT14 was increased in CBMC-iPSC-derived keratinocytes (Figure 1F). CBMC-iPSC-derived keratinocytes were confirmed by the expression of Np63 and KRT14 by immunohistochemistry (Figure 1E). These results confirmed that CBMC-iPSC-derived keratinocytes have the characteristics of primary keratinocytes. The scheme of fibroblast differentiation is shown in Figure 2A. We also maintained CBMC-iPSCs in a vitronectin-coated dish and used EB formation for fibroblast differentiation (Figure 2B,C). We attached the EBs to basement membrane matrix-coated plates and changed the medium every other day. Outgrowth cells were transferred to noncoated and type I collagen-coated plates. CBMC-iPSCs were differentiated to fibroblasts. During the differentiation, the morphology of the CBMC-iPSC-derived fibroblasts changed over time (Supplementary Figure 2). CBMC-iPSC-derived fibroblasts have morphologies similar to primary fibroblasts (Figure 2D). The expression of pluripotent stem cell marker OCT4 was downregulated in CBMC-iPSC-derived fibroblasts. Fibroblast markers of COL1A1, COL1A2, COL3A1, and CD44 were upregulated in CBMC-iPSC-derived fibroblasts (Figure 2F). Primer sequences are shown in Table 1. Also, CBMC-iPSC-derived fibroblasts were confirmed by the expression of vimentin and fibronectin by immunohistochemistry (Figure 2E). These results suggest that CBMC-iPSC-derived fibroblasts are similar to primary fibroblasts. We generated a 3D skin organoid using the CBMC-iPSC-derived keratinocytes and fibroblasts. The scheme of formation of the 3D skin organoid is shown in Figure 3A. We generated a 3D skin organoid on a membrane insert plate. For the 3D culture, CBMC-iPSC-derived fibroblasts were stratified with type I collagen and overlaid with CBMC-iPSC-derived keratinocytes. After seeding the CBMC-iPSC-derived keratinocytes, the medium was changed to a normal calcium concentration for 2 days. After 2 days, a high calcium concentration medium was added only to the lower chamber for the formation of air-liquid interface culture. The air-liquid interface culture induced the maturation and stratification of the keratinocytes. The thickness of the 3D skin organoid was increased during 3D culture. These results confirmed that the 3D skin organoid was generated from iPSC-derived keratinocytes and fibroblasts by hematoxylin and eosin (H&E) staining (Figure 3C). Using the CBMC-iPSC-derived 3D skin organoid, we generated a humanized mice model (Figure 3B) by grafting the 3D skin organoid to the mice. A 1 cm x 2 cm defect was induced, and the tie-over method was used for transplantation. After 2 weeks, the transplanted skin was efficiently grafted to the mice, and we confirmed this by H&E and immunocytochemical analysis (Figure 3D). 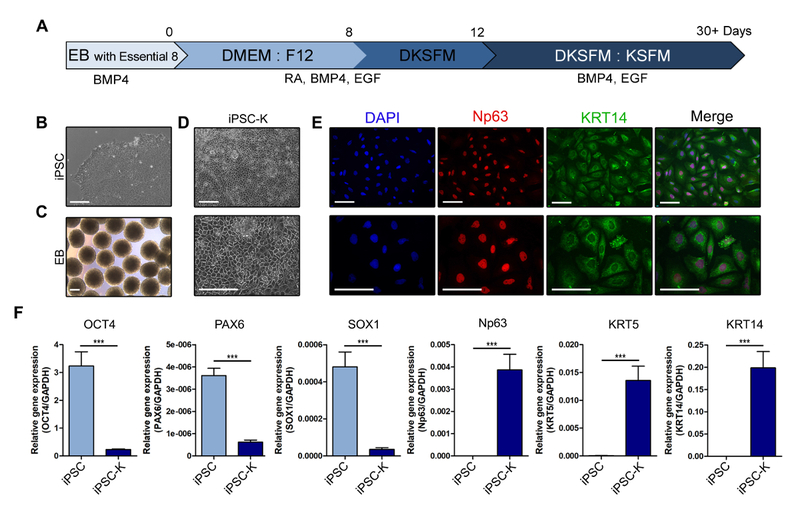 Keratinocyte maturation and the epidermal differentiation markers of loricrin and KRT14 were expressed in the CBMC-iPSC-derived 3D skin organoids (Figure 3E). The CBMC-iPSC-derived 3D skin organoids were functionally differentiated, efficiently grafted onto mice, and effectively healed mice skin defects. Figure 1: Keratinocyte differentiation of CBMC-iPSCs. (A) Scheme of keratinocyte differentiation from CBMC-iPSCs. (B and C) Morphology of the CBMC-iPSCs (panel B) and iPSC-derived EBs (panel C). (D) Morphology of the CBMC-iPSC-derived keratinocytes. (E) Immunocytochemical analysis of Np63 (red) and KRT14 (green), together with DAPI staining (blue). The scale bars = 100 μm. (F) Gene expression of the pluripotent marker and keratinocyte markers of iPSC-derived keratinocytes (iPSC-Ks). The graphs show the mean with SEM of five independent samples. Differences between groups were examined for statistical significance using Student’s t-test. The t-test was applied to analyze nonparametric quantitative datasets, and the one-tailed p-value was calculated (*p < 0.05, **p < 0.01, ***p < 0.001 indicated statistical significance). Please click here to view a larger version of this figure. Figure 2: Fibroblast differentiation of CBMC-iPSCs. (A) Scheme of fibroblast differentiation from CBMC-iPSCs. (B and C) Morphology of the CBMC-iPSCs (panel B) and iPSC-derived EBs (panel C). (D) Morphology of the CBMC-iPSC-derived fibroblasts. (E) Immunocytochemical analysis of vimentin (red) and fibronectin (red), together with DAPI staining (blue). The scale bars = 100 μm. (F) Gene expression of the pluripotent marker and fibroblast markers of iPSC-derived fibroblast (iPSC-Fs). The graphs show the mean with SEM of five independent samples. Differences between groups were examined for statistical significance using Student’s t-test. The t-test was applied to analyze nonparametric quantitative datasets, and the one-tailed p-value was calculated (*p < 0.05, **p < 0.01, ***p < 0.001 indicated statistical significance). Please click here to view a larger version of this figure. Figure 3: Generation of CBMC-iPSC-derived skin organoid and humanized mice model. (A) Schematic diagram of the iPSC-derived skin organoid (iSO) generation process. (B) Transplantation process of the iSO into mice. (C) Histological analysis of the iSO in vitro. (D) Histological analysis of the transplanted iSO in vivo. (E–H) Immunocytochemical analysis of loricrin and KRT14. MOCK control (panel E), transplanted iSO (panel F, loricrin), mice skin (negative control, panel G), transplanted iSO (panel H, KRT14). The scale bars = 200 μm. Please click here to view a larger version of this figure. Supplementary figure 1: Morphology of iPSC-derived keratinocytes. Please click here to view a larger version of this figure. Supplementary figure 2: Morphology of iPSC-derived fibroblasts. Please click here to view a larger version of this figure. Table 1: Sequences of primers used for quantitative real-time polymerase chain reaction. Human iPSCs have been suggested as a new alternative for personalized regenerative medicine17. Patient-derived personalized iPSCs reflect patient characteristics that can be used for disease modeling, drug screening, and autologous transplantation18,19. The use of patient-derived iPSCs can also overcome problems regarding primary cells, a lack of adequate cell numbers, and immune reactions5,17,19. However, the generation of personalized iPSCs is not economically feasible due to time, cost, and labor restrictions. HLA-homozygous CBMC-derived iPSCs have emerged as a new possibility. HLA-homozygous iPSCs can be economically valuable and can be applied to a large number of patients8,11,12,13. Furthermore, HLA typing of CBMCs occurs during cell bank storage, thereby making them easy to use for research and transplantation. Protocols to differentiate CBMC-iPSCs into cardiomyocytes, hepatocytes, and chondrocytes have been reported16,20,21,22,23. Epidermal and dermal layers are components of the skin. The epidermis consists of keratinocytes and the dermis consists of fibroblasts. So, we differentiated CBMC-iPSCs into keratinocytes and fibroblasts, respectively. For the differentiation, uniformed, well-controlled, and optimized EBs were generated by the hanging drop method15,24. Type IV collagen is a major component of the basement membrane. For keratinocyte differentiation, EBs were attached to type IV collagen-coated dishes. CBMC-iPSC-derived keratinocytes had a cobblestone-like morphology (Figure 1D). Keratinocyte markers Np63 and KRT14 were expressed in iPSC-Ks (Figure 1E,F). That result confirmed that RA and BMP4 induced the upregulation of the keratinocyte markers. Furthermore, CBMC-iPSCs were differentiated into keratinocytes similar to primary keratinocytes. 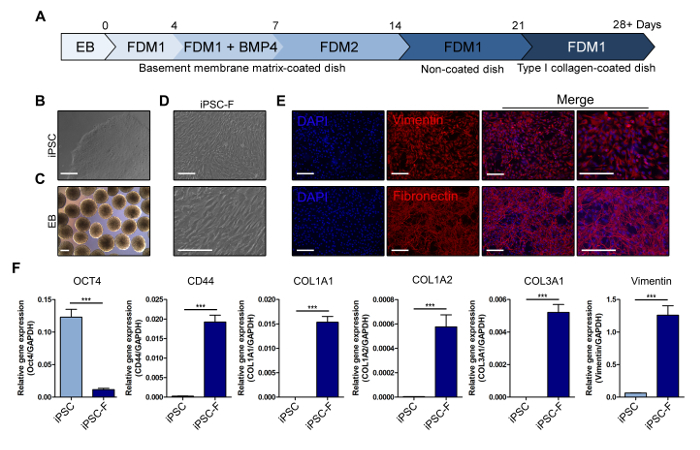 For fibroblast differentiation, EBs were attached to basement membrane matrix-coated plates, and the differentiated cells were serially passaged onto noncoated and type I collagen-coated plates. A serial subculture was induced to specify fibroblast differentiation. 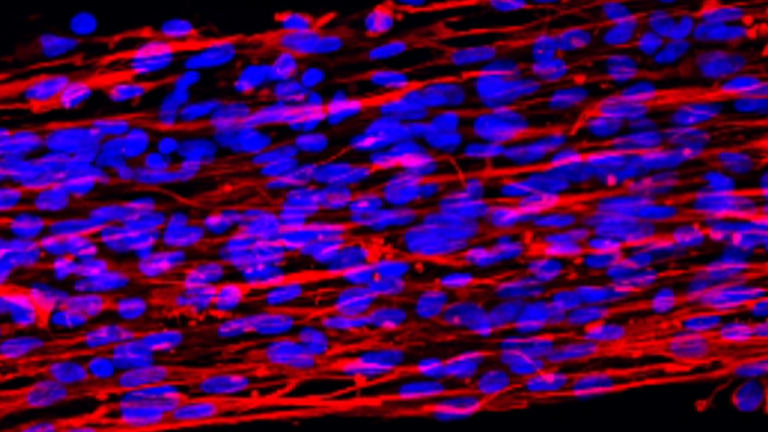 Fibroblasts produced an extracellular matrix (ECM) that had migration and adhesion functions. Fibroblasts also produce abundant collagen components25. In CBMC-iPSC-derived fibroblasts, the fibroblast surface marker CD44 was increased. The expression of the collagen was upregulated in iPSC-Fs (Figure 2F). The expression of the fibronectin and vimentin was increased in iPSC-Fs (Figure 2E). Using the differentiated keratinocytes and fibroblasts, we generated CBMC-iPSC-derived skin organoids (Figure 3A). We used an air-liquid interface culture with a high-calcium medium that induced stratified layers of CBMC-iPSC-derived skin organoids. The high concentration of calcium was necessary for keratinocyte maturation in vivo and in vitro, while the air-liquid interface was used to develop multilayered strata26,27,28. We used this method to mimic real skin, and histological analysis showed that the skin was stratified (Figure 3C). To confirm the wound-healing ability, we transplanted the iSO into mice skin, using the tie-over dressing method (Figure 3D). After transplantation, the skin organoids were efficiently grafted and healed the mice skin adequately. KRT14 was expressed in the basal layer of stratifying squamous and nonsquamous epithelia. Loricrin is a main component of the stratum corneum found in terminally differentiated and keratinized epithelial cells29,30. The epidermal differentiation marker of loricrin was expressed in transplanted skin. The expression of KRT14 and loricrin confirmed that the skin organoid was fully mature, and differentiation was demonstrated by immunohistochemical staining (Figure 3E). In this study, we developed a protocol to differentiate CBMC-iPSCs into keratinocytes and fibroblasts, the main cell types of human skin. We confirmed that the CBMC-iPSC-derived keratinocytes and fibroblasts showed phenotypes similar to primary cell lines. Using these differentiated cells, we generated a 3D skin organoid and grafted it into NOD/scid mice using the tie-over dressing method. This original technique was first described in 1929 by Blair and Brown and has been commonly used for skin grafting31,32. This method prevented the graft from moving, favored a good adhesion to the wound, and thus accelerated tissue healing. Histological analysis confirmed that the 3D skin organoid mimicked a human skin phenotype that successfully stratified and matured over 2 weeks. Skin grafting is generally performed using single cells of keratinocytes and fibroblasts by silicon bubble chamber33,34. This system is easy to graft but we needed more time for observed to transplantation efficiency after graft. The plastic or silicon chamber functions as a barrier against the mice’s skin. The 3D skin organoid system-derived iPSCs do not use a plastic or silicon chamber. In this system, transplantation was efficient; however, it was difficult to block the natural healing process of mice. So, the mice’s skin covered many parts of the iSO for a long time after the transplantation. This is a part of the method presented here that must be improved. In conclusion, CBMC-iPSCs are a potential cell source for skin grafts. Using these protocols, CBMC-iPSC-derived keratinocytes, fibroblasts, and a 3D skin organoid can be used in studies related to dermatology, drug and cosmetic screening, and regenerative medicine. This work was supported by a grant from the Korea Healthcare Technology R&D Project, Ministry for Health, Welfare and Family Affairs, Republic of Korea (H16C2177, H18C1178). Vincent, J. F., Bogatyreva, O. A., Bogatyrev, N. R., Bowyer, A., Pahl, A. K. Biomimetics: its practice and theory. Journal of The Royal Society Interface. 3, (9), 471-482 (2006). Madison, K. C. Barrier function of the skin: "la raison d'etre" of the epidermis. Journal of Investigative Dermatology. 121, (2), 231-241 (2003). Chen, M., Przyborowski, M., Berthiaume, F. Stem cells for skin tissue engineering and wound healing. Critical Reviews in Biomedical Engineering. 37, (4-5), 399-421 (2009). Dixit, S., et al. Immunological challenges associated with artificial skin grafts: available solutions and stem cells in future design of synthetic skin. Journal of Biological Engineering. 11, 49 (2017). Yamanaka, S. Induced pluripotent stem cells: past, present, and future. Cell Stem Cell. 10, (6), 678-684 (2012). Yamanaka, S. Pluripotency and nuclear reprogramming. Philosophical Transactions of the Royal Society B: Biological Sciences. 363, (1500), 2079-2087 (2008). Scheiner, Z. S., Talib, S., Feigal, E. G. The potential for immunogenicity of autologous induced pluripotent stem cell-derived therapies. Journal of Biological Chemistry. 289, (8), 4571-4577 (2014). Zimmermann, A., Preynat-Seauve, O., Tiercy, J. M., Krause, K. H., Villard, J. Haplotype-based banking of human pluripotent stem cells for transplantation: potential and limitations. Stem Cells and Development. 21, (13), 2364-2373 (2012). Takahashi, K., Yamanaka, S. Induction of pluripotent stem cells from mouse embryonic and adult fibroblast cultures by defined factors. Cell. 126, (4), 663-676 (2006). Terasaki, P. I. A brief history of HLA. Immunologic Research. 38, (1-3), 139-148 (2007). Haase, A., et al. Generation of induced pluripotent stem cells from human cord blood. Cell Stem Cell. 5, (4), 434-441 (2009). Rim, Y. A., et al. Recent progress of national banking project on homozygous HLA-typed induced pluripotent stem cells in South Korea. Journal of Tissue Engineering and Regenerative Medicine. 12, (3), 1531-1536 (2018). Nakatsuji, N., Nakajima, F., Tokunaga, K. HLA-haplotype banking and iPS cells. Nature Biotechnology. 26, (7), 739-740 (2008). Pappas, D. J., et al. Proceedings: human leukocyte antigen haplo-homozygous induced pluripotent stem cell haplobank modeled after the california population: evaluating matching in a multiethnic and admixed population. Stem Cells Translational Medicine. 4, (5), 413-418 (2015). Lin, Y., Chen, G. Embryoid body formation from human pluripotent stem cells in chemically defined E8 media. StemBook. Available from: https://www.stembook.org/node/6632 (2008). Kim, Y., et al. Establishment of a complex skin structure via layered co-culture of keratinocytes and fibroblasts derived from induced pluripotent stem cells. Stem Cell Research & Therapy. 9, (1), 217 (2018). Diecke, S., Jung, S. M., Lee, J., Ju, J. H. Recent technological updates and clinical applications of induced pluripotent stem cells. The Korean Journal of Internal Medicine. 29, (5), 547-557 (2014). Shi, Y., Inoue, H., Wu, J. C., Yamanaka, S. Induced pluripotent stem cell technology: a decade of progress. Nature Reviews Drug Discovery. 16, (2), 115-130 (2017). Yoshida, Y., Yamanaka, S. Recent stem cell advances: induced pluripotent stem cells for disease modeling and stem cell-based regeneration. Circulation. 122, (1), 80-87 (2010). Pham, T. L., Nguyen, T. T., Van Bui, A., Nguyen, M. T., Van Pham, P. Fetal heart extract facilitates the differentiation of human umbilical cord blood-derived mesenchymal stem cells into heart muscle precursor cells. Cytotechnology. 68, (4), 645-658 (2016). Stecklum, M., et al. Cell differentiation mediated by co-culture of human umbilical cord blood stem cells with murine hepatic cells. In Vitro Cellular & Developmental Biology - Animal. 51, (2), 183-191 (2015). Nam, Y., Rim, Y. A., Ju, J. H. Chondrogenic Pellet Formation from Cord Blood-derived Induced Pluripotent Stem Cells. Journal of Visualized Experiments. (124), e55988 (2017). Rim, Y. A., Nam, Y., Ju, J. H. Application of Cord Blood and Cord Blood-derived Induced Pluripotent Stem Cells for Cartilage Regeneration. Cell Transplantation. (2018). Shevde, N. K., Mael, A. A. Techniques in embryoid body formation from human pluripotent stem cells. Methods in Molecular Biology. 946, 535-546 (2013). Shamis, Y., et al. iPSC-derived fibroblasts demonstrate augmented production and assembly of extracellular matrix proteins. In Vitro Cellular & Developmental Biology - Animal. 48, (2), 112-122 (2012). Bikle, D. D., Xie, Z., Tu, C. L. Calcium regulation of keratinocyte differentiation. Expert Review of Endocrinology & Metabolism. 7, (4), 461-472 (2012). Bernstam, L. I., Vaughan, F. L., Bernstein, I. A. Keratinocytes grown at the air-liquid interface. In Vitro Cellular & Developmental Biology. 22, (12), 695-705 (1986). Prunieras, M., Regnier, M., Woodley, D. Methods for cultivation of keratinocytes with an air-liquid interface. Journal of Investigative Dermatology. 81, 1 Suppl 28-33 (1983). Steven, A. C., Bisher, M. E., Roop, D. R., Steinert, P. M. Biosynthetic pathways of filaggrin and loricrin--two major proteins expressed by terminally differentiated epidermal keratinocytes. Journal of Structural Biology. 104, (1-3), 150-162 (1990). Hohl, D., et al. Characterization of human loricrin. Structure and function of a new class of epidermal cell envelope proteins. Journal of Biological Chemistry. 266, (10), 6626-6636 (1991). Bern, R., et al. Original and modified technique of tie-over dressing: Method and application in burn patients. Burns. 44, (5), 1357-1360 (2018). Joyce, C. W., Joyce, K. M., Kennedy, A. M., Kelly, J. L. The Running Barbed Tie-over Dressing. Plastic and Reconstructive Surgery - Global Open. 2, (4), 137 (2014). Wang, C. K., Nelson, C. F., Brinkman, A. M., Miller, A. C., Hoeffler, W. K. Spontaneous cell sorting of fibroblasts and keratinocytes creates an organotypic human skin equivalent. Journal of Investigative Dermatology. 114, (4), 674-680 (2000). Yang, R., et al. Generation of folliculogenic human epithelial stem cells from induced pluripotent stem cells. Nature Communications. 5, 3071 (2014).